I have been completely won over by both of these cleansers, and they work in perfect harmony to give me the cleanest face I think I've ever had, and the most effective double cleanse I've tried. I must admit it took me way too long to realise that these both have 'ultra' in their names! I begin with Lush's Ultrabland cleanser, which dissolves makeup almost instantly. It's thick creamy texture feels so soothing. It smells a little bit like honey, but it's nothing too overpowering. I have to say, this reminds me slightly of Emma Hardie's Cleansing Balm in the way that it feels and works, but this is a lot thicker, richer and a little harder to remove. For this reason I always follow it up with a tiny dollop Kiehl's Ultra Facial Cleanser, just to make sure every last scrap of makeup and Ultrabland is removed. I picked this up earlier on in the month, whilst in London (a bit of an last-minute impulse buy, if I'm honest. You should see my cleanser collection..), and I have used it every day since. I'd been avoiding foamy face washes for quite a while as often I find them too harsh and drying, but I'd missed the way they really make your skin feel 'super clean'. This cleanser is so gentle, but I do find it does take quite a bit of rinsing as I'm not used to having a bubbly face! 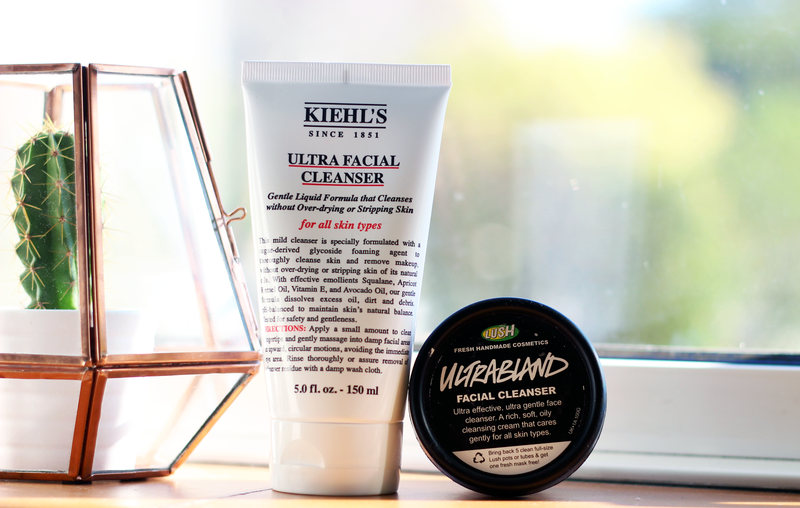 In the mornings, I'll skip Ultrabland and just use the Kiehl's, and I still never feel any dryness or irritation. But if I use just Ultrabland at night, I do occasionally feel like some of the product is left on my face, hence the double cleanse. My skin looks brighter, clearer and seems to respond better to any serums or treatments I apply afterwards. I really can't see myself changing this little routine anytime soon, I think I've found my ultimate pairing! Ultrabland is so so good! I do intend on picking it up again once I've got through some things. This sounds like such a lovely duo! I'm no good with skin care so I'm trying to read more reviews and stuff to see if I can find some good products to use!